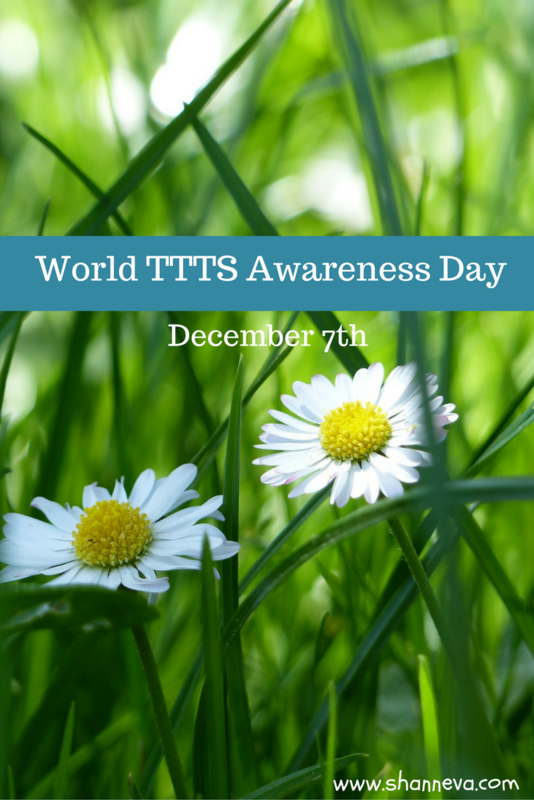 December 7th is World TTTS Awareness Day. A number of prominent landmarks will be lit in blue to symbolize the fight against this terrible syndrome. I’m going to share a few facts with you about Twin to Twin Transfusion Syndrome, and I’m also going to share why this is such an important cause to me. I hope that once you finish reading this post that you’ll join me and countless others in our fight to save babies. TTTS awareness is the most important thing. -Twin to Twin Transfusion Syndrome (TTTS) is a disease of the placenta (or afterbirth) that affects identical twin pregnancies. -TTTS affects identical twins (or higher multiple gestations) who share a common monochorionic placenta. -The shared placenta contains abnormal blood vessels which connect the umbilical cord and circulations of the twins. -The common placenta may also be shared unequally by the twins. -The events in pregnancy that lead to TTTS are all random. -TTTS is not hereditary or genetic, nor caused by anything the parents did or did not do. -TTTS can happen to anyone. While they say that TTTS is very rare, my twins started showing signs when I was 14 weeks pregnant. One of my twins was 25% larger than the other, which can be a sign of either TTTS or SIUGR (Selective Intrauterine Growth Restriction or unequal placental share). Today, I want to share another family’s story. 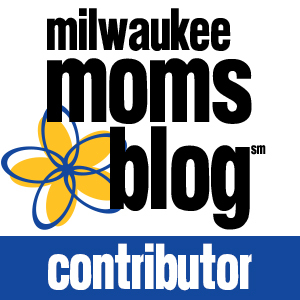 As a mother to TTTS survivors, I belong to an online support group. When I asked for other stories to spread awareness, Sierra emailed me right away. I’m so happy to be able to share their story with you today as told by Sierra, on World TTTS Awareness Day. We have identical girls. We were barely 15 weeks when they caught it (TTTS). We were stage 3 (TTTS is commonly staged in severity from 1 to 5.) Thankfully, we had to make an early appointment due to a car accident, or it would have been another week before we had an ultrasound. Our Baby A was getting way too much. We had to travel about 4 hours away (the hospitals around us are not equipped to handle complicated multiple pregnancy situations) to get the laser procedure, and pray it worked. 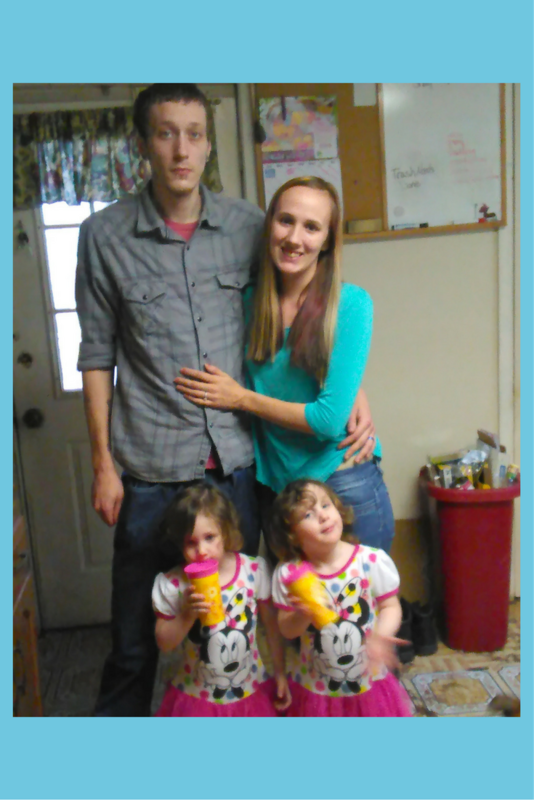 That was when we found out we were having girls, as well as baby a (the recipient) developed pulmonary stenosis. For a month, we traveled those four hours once a week to make sure everything was going smoothly, as TTTS could still come back. Everything went well, so we went back to our regular doctors. About a month and a half later, they feared TTTS was back, so for another two weeks it was a 4 hour trip. That’s when they decided if I could make it to 34 weeks, they’d do a c-section. The contractions started again, and Baby A pushed herself all the way down and Baby B was as far up as she could. They sent me 2 hours away for observation, and then changed their minds, and we did an emergency c-section. The day before they were born. You can see one is up, and one is down. I don’t remember much of the first night, as they gave me something I was allergic to. This caused them to give me Benadryl, which knocked me out. The next day, actually afternoon, I got to see both girls. 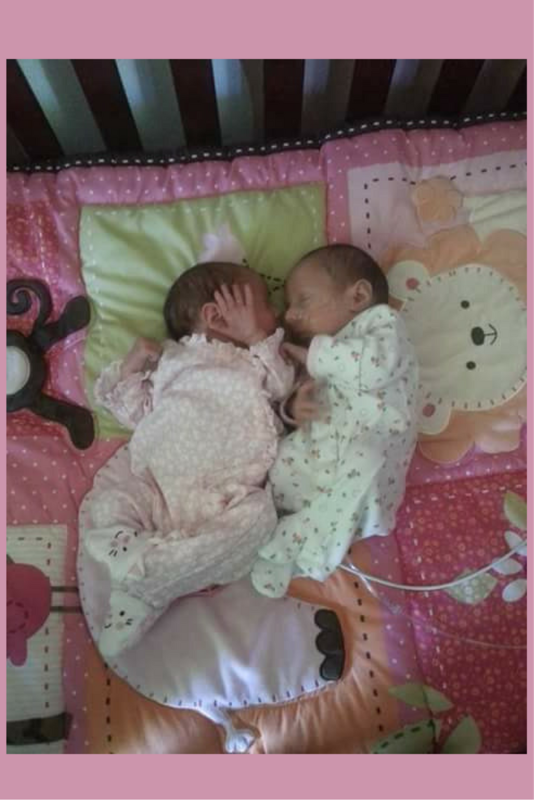 Baby A (Lillianna) was 4 lbs 10 oz 18 in, and Baby B (Annabella) was 4 lbs 13 oz 18 1/2 in. Then came the doctors. Lillianna’s heart was worse than they thought and she needed to be transferred to a different hospital (another 2 hours away) for surgery that night. So, we picked the hospital and she was transferred. My husband and mother-in-law went with Lillianna, while I stayed (wasn’t released for four days) with Annabella. The day after they released me, Lillianna had her heart surgery. Thankfully, I was able to be there, and bring a nice sized supply of milk for her. 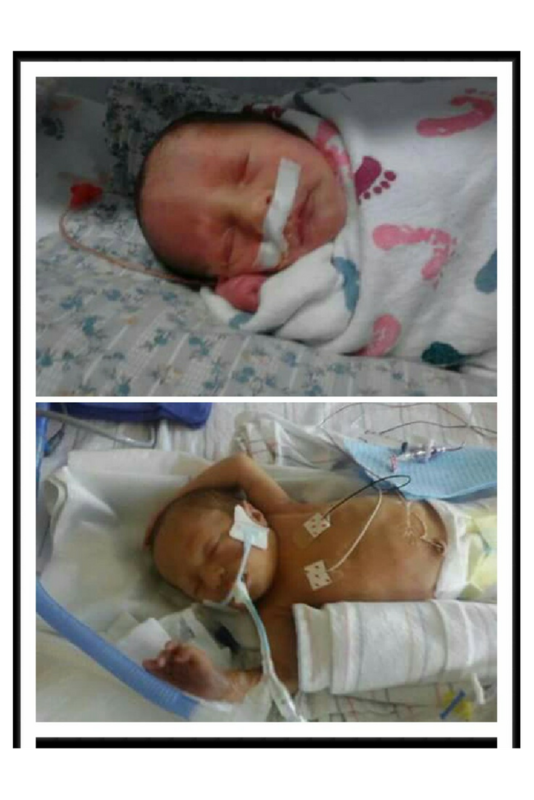 The girls stayed in the NICU for about a month. 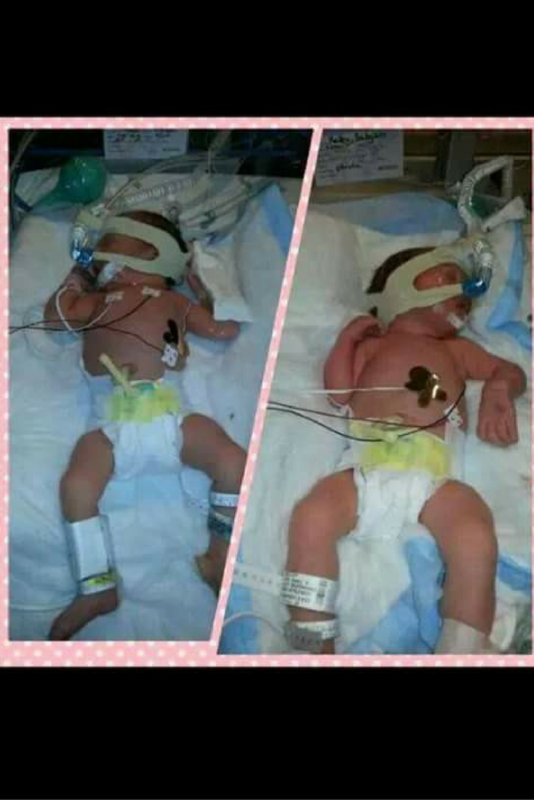 Lillianna came home on oxygen and a pulse ox, and Annabella came home the day after perfectly healthy. We just celebrated their 3rd birthday! We monitor Lillianna’s heart every 6 months, as she’s not in the clear yet, but they are both healthy and spunky as ever. Thank you so much to Sierra and Allen for sharing their story and their precious survivors with us. I’m so grateful for their help on World TTTS Awareness Day. You can also help #FightTTTS. Share this post, talk with your friends, or visit the TTTS Foundation website today. If you, or anyone you know, is pregnant with twins, please see a Maternal Fetal Specialist and get an early ultrasound. The more TTTS awareness that there is, the greater the chances of saving more babies. I have two really good friends with identical twins and I hadn’t heard of TTTS. WOW. SO happy these sweet girls (and your boys) are healthy !!! They are so adorable! I’m definitely much more aware of this cause from following your blog, it’s not something I would have known much about otherwise. Thank You for bring awareness to TTS. I never knew anything about TTS until I came across your blog. My boyfriends mom is a twin, so there is a chance that we could have twins in the future, so this is so helpful to know about. Lilliana and Annabella are beautiful! I hope they continue to do well! So sweet! Love that they are doing so well now! You are so brave for posting this and bringing awareness. Thank you for making everyone aware about TTS! This is very informative! Thank you for explaining, this is all new to me so I’m glad I know what TTTS is. Thank you for sharing about this. I had no idea! 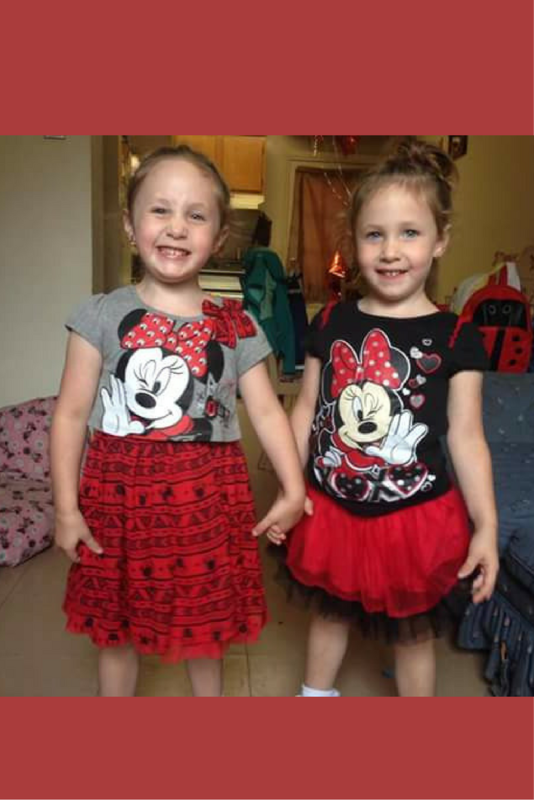 Beautiful little girls!! It tugs at my heart strings to hear these stories! Blessed for sure! Wow thanks for bringing awareness to this – I have never heard of it and I love being more aware of things like this. Wow what an amazing story. I am glad you shared this because I have friends with multiples. I am glad you had a good outcome and your babies are thriving!